The Nonwoven Institute serves as a convenient central resource and support center for the nonwovens and fiber based industries. 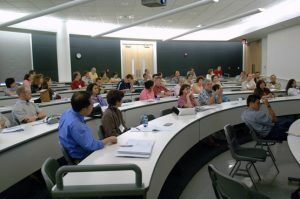 The NWI’s outreach and partnership development objectives are accomplished through a vigorous program of 1) information dissemination; 2) ongoing cultivation of dialogue and networking opportunities for industry professionals; 3) the establishment of linkages between industry leaders and their university-based counterparts and collaborators; 4) company-focused technical training services offered on-site; and 5) internships offering students real-world exposure to the industry and its fast-changing technologies. While the NWI works with prominent corporate names that are among the world’s industry legends, its services and expertise also support promising entrepreneurial ventures and the expansion of small, privately-held firms. NWI collaborates with companies at all stages of growth that are embracing exciting new discoveries in nonwoven based innovative fibrous systems. The Institute is committed to enhancing the competitive posture of the nonwovens industry, which holds lucrative economic development potential for communities in North Carolina and beyond.